I got my first Pura Vida Bracelet back in 2011, long before the spiffy packaging, celebrity spottings and fancy marketing. 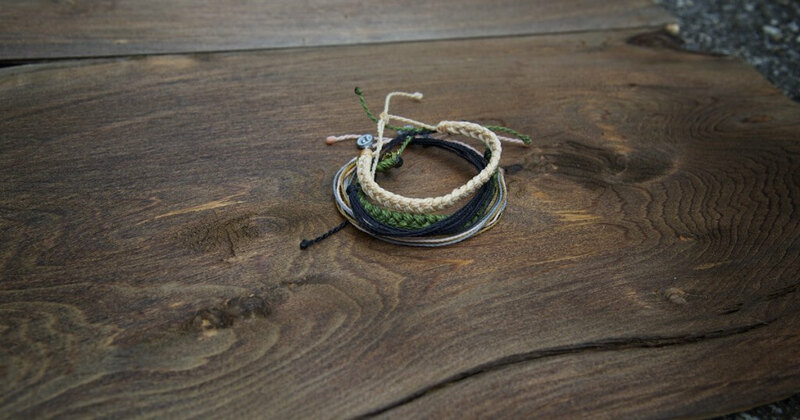 They’ve come a long way from the simple white envelope packaging, but one thing has remained the same: they’ve stayed true to their roots creating high quality bracelets and promoting the Pura Vida lifestyle. 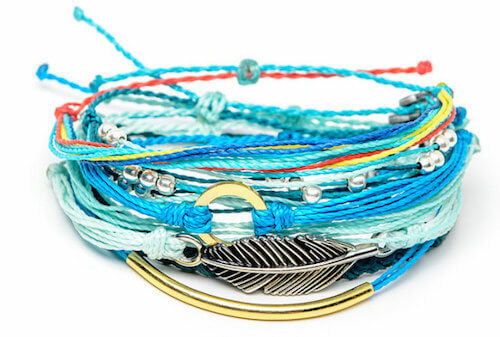 Pura Vida Bracelets are simple and stylish with fun designs and colors. 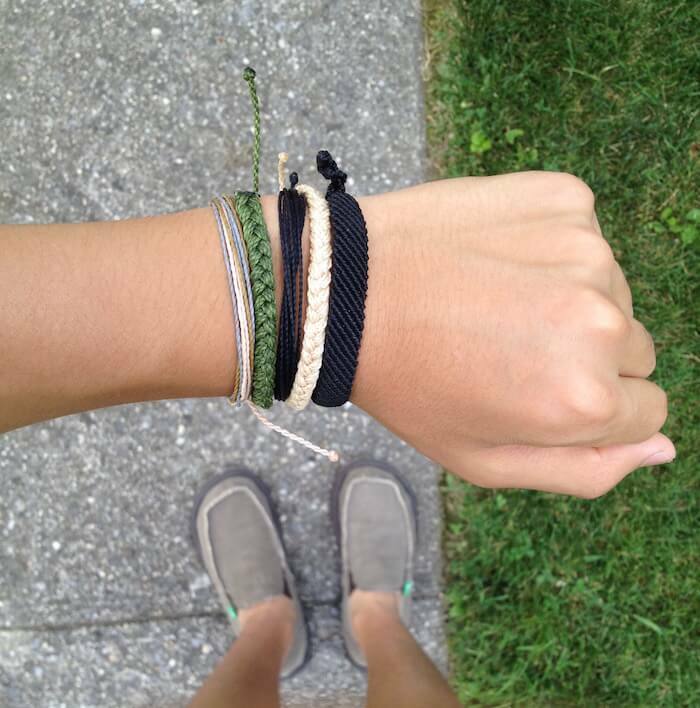 When you first put on your Pura Vida Bracelets, you’ll notice that they’re kind of waxy. Eventually, waxy and stiff feeling will go away after you wear the bracelets for a while. In my opinion, Pura Vida Bracelets are like leather in the way that they look and feel better with age. Here are some of the positive aspects of Pura Vida Bracelets. I’ve worn Pura Vida Bracelets for a pretty long time and wore a Solid Black bracelet for over one year straight. I traveled around the world with that black bracelet on, showering, flying, swimming, laughing and crying, never taking it off until it broke. Considering it was a $5 bracelet and that I wore it for around 10,000 hours straight, I’m impressed by it’s durability. Photo taken while I was in Yogyakarta, Indonesia near the world famous Borobudur Temple. 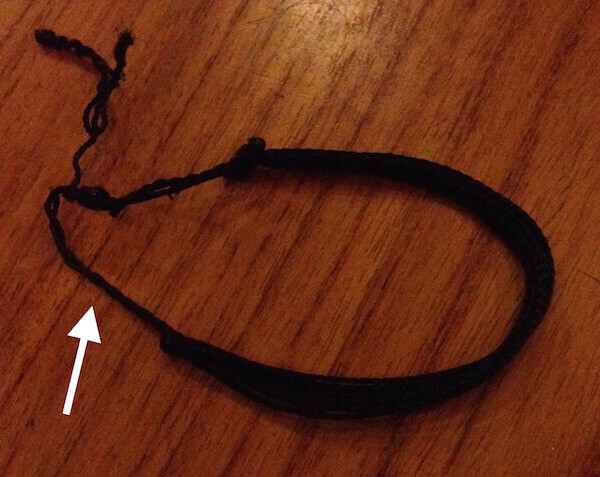 The part of the bracelet which broke was between the adjustable closure and the beginning of the loose strands, where the “P” charm was. While I haven’t tested my braided bracelets for very long, I can say that they’re more durable than the original bracelets because they are thicker. The bracelets have a laid back and fun vibe, perfect for travelers, beach lovers and everyone in between. While I’m no style expert, I think these bracelets are stylish and great for almost any occasion. After wearing Pura Vida Bracelets for a while, I’ve stopped noticing the bracelet on my wrist. They’ve become an extension of my arm. The bracelets are all adjustable from 2-5 inches in diameter, which should fit most people. As I mentioned above, the bracelets get softer over time, thus more comfortable. You won’t be able to use the bracelets as anklets (unless you have a really small foot) but Pura Vida also sells anklets which adjust between 3-6 inches in diameter. Can Guys Wear Pura Vida Bracelets? Prior to getting Pura Vida Bracelets, I thought they were a bit feminine, but after wearing them for a few years I now know that they’re for men as they are for women. I am still the only male whom I know wears Pura Vida Bracelets, but it feels good to be a tastemaker. I’m a minimalist type of guy, so I tend to wear just one Pura Vida Bracelet at a time, my favorite being the original Solid Black. I’m also a big fan of the Flat Braided Black, which matches with almost much everything. You can check out the Pura Vida Bracelets website which has more information and a style guide for men. 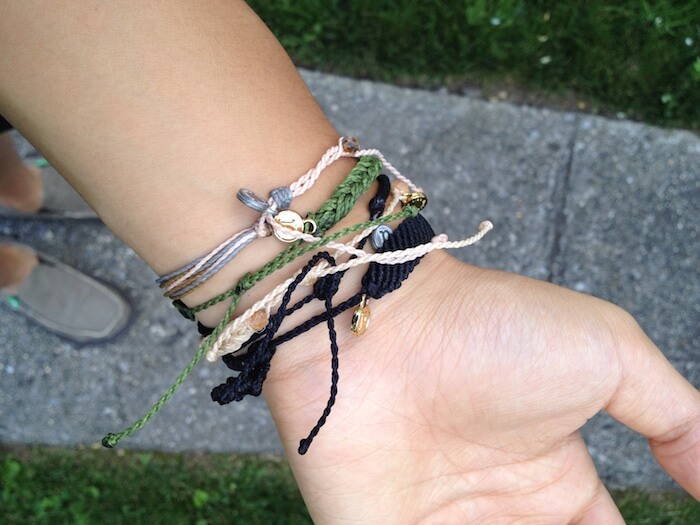 I have a small wrist, so when I tighten the bracelets there’s a lot of extra string left over. I usually tie the extra string so it doesn’t stick out as much, however it can be annoying and get in the way. Pura Vida Bracelets are simplistic and stylish bracelets perfect for those living life to the fullest – especially travelers. Although I have a few minor gripes about the bracelets, they’re fun and durable and I highly recommend them. What do you think about Pura Vida Bracelets? Leave a comment below. I would love if they show proof of the artisans in like photos and videos, and they need to hire someone who knows how to run a business, they need to updated their website as a lot of the stores in the store locator for my area didn’t have a clue what a Pura Vida bracelet was, they also need to have better communication skills and better customer service skills they lack in those departments a lot. I bought mine from a locally owned boutique as they finally had them in stock (I highly recommend you buy yours at a boutique near you call first I wandered around for 2 days looking in the stores they had on the store locator list waist of time as I said in the beginning a few of the stores didn’t have it or had any idea what I was talking about and a few of the stores on the list had been closed for a while I contacted them to let them know the stores were closed they still have them on the list as stores selling the bracelets). Also they just need to fire all the employees who are supposed to be dealing with the website and customer service and shipping and hire people who actually know what they are doing. Also I applied to be a brand ambassador and they told me my discount code to share would be my first and last name plus the number they gave me and they would contact me in a few days to a week to confirm the discount code it’s been several months. I know I misspelled a few words had frustration to vent. I love the bracelets! I have 9 of them, and the wave ring. The only thing that I don’t like is the fact the the anklets are too small. I don’t have a huge foot, size 8-81/2. I bought a Pura Vida anklet and it won’t fit over my foot. Since they are adjustable, why can’t you make them longer, then the can be adjusted to fit the ankle. Now I have to wear my anklet as a bracelet, and I WANT AN ANKLET!!! MAKE THEM LONGER…PLEASE???!!!!! !